You can use it to import data and reports from Salesforce into Sheets, and to push updates you make in Sheets back to Salesforce. This seamless integration will help your users optimize workflows and reduce duplicate work between the two products. For example, your Finance team could use the add-on to perform an in-depth forecast based on all current deals in the pipeline. The add-on would pull all data from the relevant Salesforce report into Sheets, where Finance team members could then use other powerful Sheets features, such as Explore, pivot tables, or macro recorder. Or the Sales team could use the add-on to import the details of their accounts from Salesforce and use Sheets to do a bulk update that pushes the changes back to Salesforce. As a G Suite admin you can control access to this add-on the same way you can with any other Sheets add-on. If you want to control add-ons across you domain, see disable or enable add-ons overall in Docs editors. 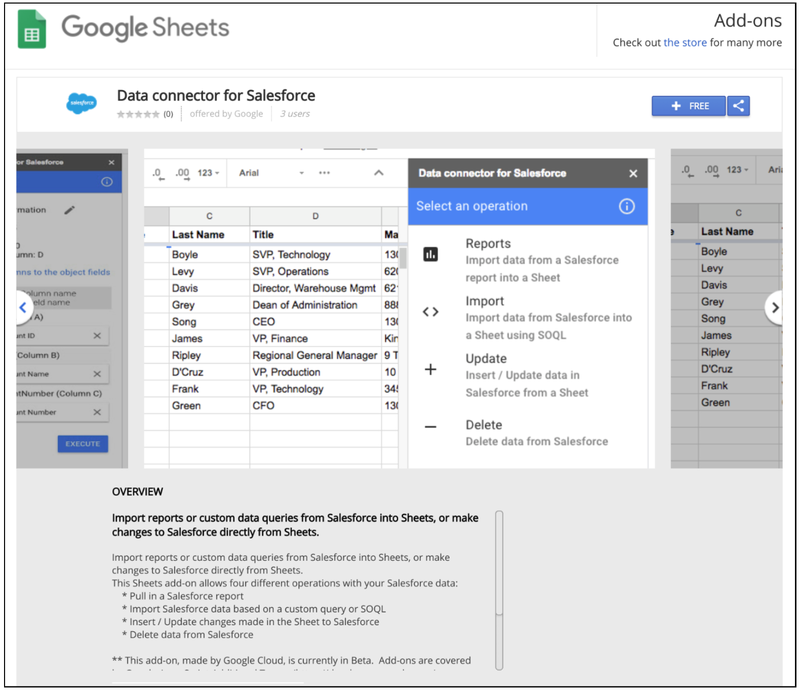 See our Help Center for more details on how to import, edit, and sync Salesforce data with Google Sheets. We’re publishing an add-on for Google Sheets to connect with Salesforce.